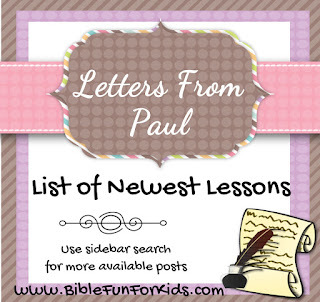 Click the title under each picture to see the newest list of lesson links. How to plan your curriculum, things to consider & more. Please note: These are links to lessons in a series. find more options for your topic. See right sidebar for more posts! I love your lessons....How can I print the lesson on Daniel? Dianna, you can find some of the Daniel lessons here: http://www.biblefunforkids.com/2014/03/old-testament-people-lesson-list-links.html or you can find them all using the search bar on the right. Everything should be on the post for you. Thanks for stopping by! Thank you so much!! I love your website. God Bless you and yours! Hi! nice post. Well what can I say is that these is an interesting and very informative topic for preschoolers as well as parents. Thanks for sharing with us. I am so glad I found this site! I love the lessons, visuals, lapbooks, etc. It is refreshing to find such Biblically sound literature. Thank you for sharing. Thank you for all of your hard work on these lessons. They are awesome! I have a small class that I teach, and this site is a great help to me!